Ysolda is a Nord citizen who lives in Whiterun. She is one of the few citizens who trusts the Khajiit traders traveling across Skyrim, and her greatest dream is to buy the Bannered Mare from Hulda. Incidentally, should something happen to Hulda, you will find Ysolda taking her place behind the desk in the taproom. During your drunken stupor in A Night To Remember, you will unconsciously buy a wedding ring from Ysolda, for your beloved Moira. Ysolda also has a great secret, discovered during the quest Sleeping Tree Cave. Ysolda owns a small house behind Arcadia's Cauldron and sleeps there every night between midnight and 8am. After waking up, she immediately leaves for the market, where she drifts around until 3pm and returns to her house for an hour of relaxation. At 4pm, she will patrol around the entire town, carrying her basket with herbs, until she finally enters the Bannered Mare at 8pm, where she stays until her bedtime at midnight. 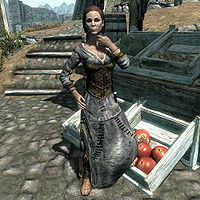 If she takes over the Bannered Mare, she will stand behind the counter 24 hours a day, without ever eating or sleeping. She wears clothes and boots and carries an iron dagger, her house key and a selection of middle-class items and gold. When you approach her, she will comment: "I spend a lot of time at the market stalls so I can learn the merchant's trade. I need more experience if I'm going to run an inn someday." She will then explain how she thinks she is capable of achieving her dreams, saying: "They say there's nothing a Nord woman can't do if she puts her mind to it." and "We Nords are strong, and we're as tough as stone. But I'll bet you didn't know there's some of us with a good head for business, too." She also has a weak spot for a certain bard, commenting: "There's some company I certainly prefer over others. Have you met Mikael? The most amazing bard I've ever heard." If you talked to her inside her house, she will exit conversation by mentioning Mikael again: "Goodbye. And if you happen to see Mikael, tell him I was asking about him..." When asked what she knows about the Khajiit she states: "About the same as everyone else. They're the cat-folk of Elsweyr. Great warriors, good traders. Way I hear it, Elsweyr ain't nothing like Skyrim. It's got tropical forests and dusty badlands. It sounds awful!" She will also elaborate on the trading caravans: "Yeah, these Khajiit make a living traveling the roads and selling their wares. It's got to be tough. Skyrim's a hard enough land when you've got a roof over your head. Worst thing is, nobody wants them in the cities. Nobody trusts them." She will defend them if asked why nobody trusts them: "Reputation, mostly. A lot of Khajiit turn to smuggling and thievery to get by. A few bad apples spoil the bunch. You know how it is." However, upon asking "Do you trust them?" she will state: "Matter of fact, I do. They've been fair enough with me, far as I can tell. And a Nord knows a liar when she sees one." When asked, she will explain how and why she wants to learn the caravan trade to become a better merchant, hinting that she needs a favor: "Before my ma and da passed, I told them that one day, I'd become the best trader in Skyrim. I met one of the caravan leaders, Ma'dran. He said he'd help get me started if I could bring him a mammoth's tusk. Easier said than done." If you wish her the best of luck with the mammoth tusk, she will say: "I'll do my best." If you offer to help her, she will instead say: "You'd do that? If you find one, I could teach you a thing or two about trading. Help you get a fair bargain in the future." When you return to her with the tusk, she will thank and reward you with a lesson in Speech: "Thank you. This should turn that old cat's gaze. Maybe I'll be able to become a caravaneer myself, one day. As promised, let me show you a thing or two about bargaining. Don't want some shifty merchant giving you a raw trade." After investigating the Sleeping Tree Cave you will discover she has a darker side hidden underneath her sunny veneer. It turns out she is involved in trading Sleeping Tree Sap with the Khajiiti. After her supplier Ulag is discovered dead, you can take over for him selling the drug at 150 gold each. When you mention that you found a note on Ulag's body, she'll reply: "Did you? So Ulag didn't make it passed [sic] those giants then? More's the pity. If you found any of the sap, I'd be willing to pay you the same cut I offered him. Better price than you are likely to find otherwise." Asking about the tree will prompt her to tell you what she knows: "How the tree came to grow there is a bit of a mystery... Some say that when Vvardenfell erupted, a piece was blown to the middle of Skyrim and from the crater grew the tree. I've also heard that it was a spore that fell from an island floating in the sky, but that just sounds like nonsense. All I know is that the sap makes you feel as healthy as a cave troll, but slow as a drunk horker. And that and it fetches good coin." When you have more to sell to her, she'll say "Ah, of course! How much have you got?" and when exiting the conversation, "Very good. Be sure to bring any more Sleeping Tree Sap you find to me." "Look, I've been patient, but you still owe me." Seriously, let me pay you for the ring. (2000 gold) Passed: Decided to go through with it then? I knew you couldn't have forgotten about your fiance [sic]. You spoke of her so glowingly. I don't know much about Morvunskar but it sounded like a lovely place for the ceremony. Congratulations. Failed: I think I would prefer my ring back. I put a lot of time into making it and you just gave is [sic] away as a joke. I just need to get to the wedding. Please. (Persuade) Passed: You must have had a wild night if you can't remember that. But I suppose everyone gets the jitters before their wedding. And I did say you could take a bit of time paying me back. You said the ceremony was going to be at Morvunskar. Don't forget you still owe me! Failed: I'm sure your bride-to-be will tell you when you [sic] where the ceremony will be. If she still wants to marry you when you tell her you can't afford the ring. I don't care about the ring! Tell me what else I said! (Intimidate) Passed: All right, all right. You're mean when you're sober. You said you [sic] the ceremony was going to be in Morvunskar. You said your friend Sam was going to be your best man. Failed: You think you can bully me. I grew up with five brothers. Go... get...my...ring. What was that story about my fiancee [sic]? How could you forget? It was the sweetest story I'd ever heard. You met at the full moon, under the biggest tree in Witchmist Grove, surrounded by fireflies. It was straight out of a storybook. If you chose to head to Mistwitch Grove and claim the ring from jealous hagraven Moira, you will be prompted to return the ring to Ysolda. When you hand it to her, she will respond: "Excellent! Sorry it didn't work out with you and your lady. I know how excited you were for the wedding. You kept saying it would be a huge ceremony at Morvunskar. You said you even had some magic staff there that would handle all the guests." Nazeem: "Ah, Ysolda was it? What brings you to the market?" Ysolda: "I'm here to buy food, Nazeem. I suppose you don't need to worry about that." Nazeem: "Owning a farm does have its advantages." Ysolda: "Those green apples you sold me the other day were delicious." Carlotta: "Aren't they? I always set some aside for myself when the traders bring them up from the south." Ysolda: "I'm sure you could charge double for those and still sell them all within a week." Carlotta: "You're right. I'll have to remember that the next time I get a shipment in." Ysolda: "Are you still working at the Bannered Mare in the evenings, Olfina?" Olfina: "And why shouldn't I? Just because I'm a Gray-Mane doesn't mean I can't earn my own keep." Ysolda: "I didn't mean... I'm sorry I asked." Brenuin: "Spare a coin for a fellow Nord who's down on his luck?" Ysolda: "So you can spend it on drinks at the Bannered Mare? If it's food you need, ask for that instead." Brenuin: "Never you mind, then. I'll find a more charitable soul." Ysolda: "That's what I thought." Ysolda: "I've got a recipe for venison stew that I want to try out. Will you have venison anytime soon?" Anoriath: "Certainly. I'll be sure to bring some back for you the next time I go hunting." Ysolda: "Make it quick, and there might be a bowl of hot stew in it for you." During A Night To Remember, even if you have married Ysolda she will still talk to you about being engaged to someone else. 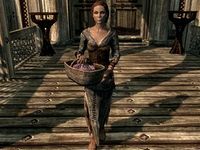 If you marry Ysolda before completing the Battle for Whiterun quest and are living in a home other than hers, after the battle is over, she may be found in her own house in Whiterun. You must tell her to move houses again. Ysolda has no unique dialogue if the player is a Khajiit. Patch 1.5 sets Ysolda as essential. Although the patch notes the change as essential "until her part in A Night To Remember is completed", she is simply set as essential for the entirety of the game. Ysolda offers dialogue to the player regarding becoming the eventual proprietor of the Bannered Mare. If the original owner Hulda dies, Ysolda inherits the Mare. However, Ysolda's dialogue does not change and she does not act as a vendor, nor does she offer any rumors, rendering The Whispering Door unobtainable. This issue has been addressed by version 1.2 of the Unofficial Skyrim Patch; Mikael already had dialogue to be the backup innkeeper instead. If something happens to Belethor, it's possible for Ysolda to inherit Belethor's General Goods. She cannot be traded with as she should not be there. This page was last modified on 20 December 2018, at 05:27.